Jesus – Best Tutor Ever. Fri, 13th Nov '09 at 13:52 by Christopher. Rich Carter? Best school tutor ever? “mr cartA rules serious tutor’ness”?!? Didn’t see that one coming did ya. 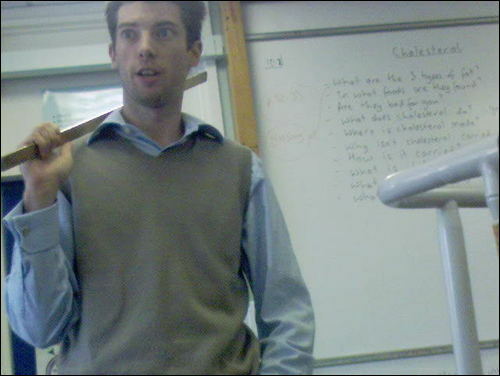 Just watch what you do with that ruler, eh Mr C? Who said mobiles in school were a bad thing. Autograph hunters this way thankyou please. Up next week – Where’s Wally Dan Harris. Added to the The Crocketts category/s. Follow responses to this entry through the RSS 2.0 feed. You can leave a response, or trackback from your own site. Hi! I’m Hutton. The fantastic French lessons, German tutoring, Spanish tuition and 11 Plus lessons at bespoke languages tuition are what make it one of the leading educational providers in the UK, across Europe and in the USA. Outstanding!